People all over the world are ready to throw parties to celebrate Eid al-Adha with family and friends. The essence of this festival is “sharing meals “and Muslims do this celebration quite lavishly. They change the home décor and organize a grand Eid al-Adha party. Every host wants their sweet home to turn into a rocking den for the party. Bedroom as well is a great fun place for get together after dinner. Family and relatives would love to spend time in bedroom and gossip. Major portion of bedroom is occupied by bed and then window and door curtains. Decorate your gossip hub by spreading printed design colored double bed sheet such as Block Print Bed Sheet, Patchwork bed sheet and many more. You can even spread comforter on top of the bed sheet as a topping. 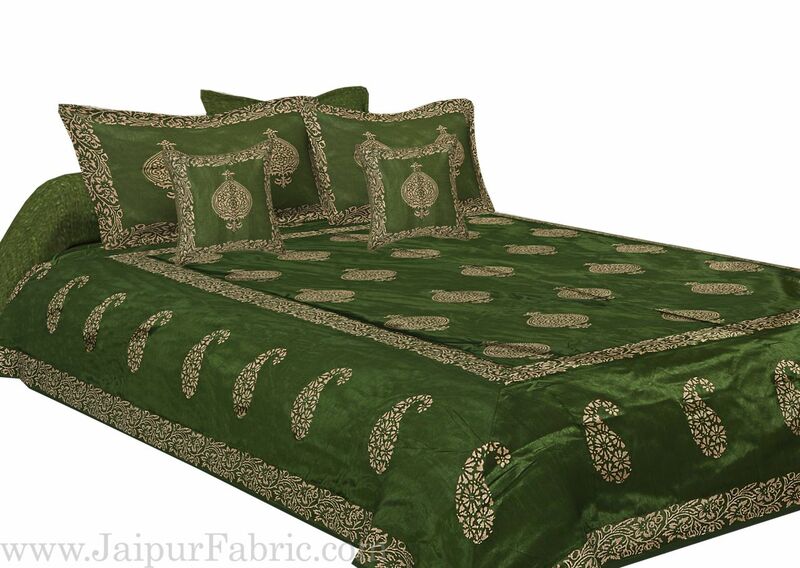 Comforter makes your bedroom glamorous and gives a cozy feel as well. Put some hanging appealing curtains to make a proper time spending spot for families and relatives. The living room is the major stage for the party eve. While hosting a party for Eidal-Adha, the living room should have all the colors and the props for the festival. To set a festive mood for the visitors, the main door of the apartment could be decorated with Ramadan banners, festive messages, and glass bead chimes. You could hang colorful confetti garland in the hallway of the living room. To add warmth and style to the living room, you could choose a bright red Turkish rug with “mirhab pattern”. The glittery golden “mirhab pattern” on the center of the rug would not only ornate the festivities but also capture the essence of Eidal-Adha. The addition of a Tukish rug in a festival is interesting because each motif on a Turkish rug symbolizes a particular emotion. You could skip the idea of an elaborate center table; instead you could set a wooden Japanese table surrounded by a floor sitting arrangement. The Japanese center table does not mean a bland ambience. You could customize the table décor to give a colored theme to your seating area. You could put golden colored table runners on the table and lit the table with candles using vintage purple glass holders. To give a traditional Islamic décor on the center table, put golden colored Moroccan tea set on the table. Floor seating arrangement is fun and casual. Make the seating arrangement more comfortable with comfy mattresses and cover them with bright purple colored mandala print diwan cover. You could play around with cushions and side pillows. Cover the cushions and side pillows with mirror work cushion and pillow covers. Mirror work would add dazzle into the ambience. Instead of heavy curtains use pink chiffon drapes and hang tiny star decorative garland lights to give a starry effect. Wall decorations make a visual impact and would change any mood into a party mood. Spice up the bare wall with family photos. You could also make collage of your happy moments with your family. It gives a joyous and loving environment to your celebrations. To have an Eid al-Adha like feeling, use wall hanging with merry messages and ornate the surrounding wall with crescent moon wall decorations. It is amazing to see how home furnishing items and choice of colors of the props have ability to create a joyful and celebrating mood. Collection of colored glass jars, string lights, and bright wall hangings add shimmer to your festivities. This Eid al-Adha picks your own theme and shares the joy with your loved ones.